October is throwing a party, and leaves by the hundreds are here. With this edition of SPOTLIGHT we have some exciting news to share with you. We have a brand new partnership announcement, just released products for your Lyngsoe Systems library solutions and finally spotlight on two wonderful libraries, one in France and the other in the USA. 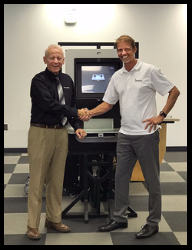 We are excited to announce that EnvisionWare,Inc, GA is now an official distributor of automated materials handling solutions from Lyngsoe Systems, MD. With this agreement, two library efficiency leaders will offer public libraries a diverse catalog of possibilities to free up resources and enrich their services. This package provides a central monitoring solution for all PC’s and software from Lyngsoe Systems. Automated set-up, monitoring, patching and standard reports are all included. This package allows for additional alert communication channels and access to Lyngsoe Systems specialist support. Automated anti-virus updates and operating system patching. The additional opportunity to define automated responses to alerts in this package brings PC up time to the highest level, and a backup manager provides the extra safeguard for continued service to patrons. The Lyngsoe Tote Check-In Server™ is designed for libraries shipping large volumes of totes from central processing, typically containing 30-40 items each of these requiring a repetitive and time-consuming individual scan. This new product eliminates the repetition by allowing one single scan of the tote, triggering the automatic check-in of all the items in it. Through an administrator dashboard there is access to detailed reports of the sorting status and processing operation, also it’s now possible to track the tote location or finding an individual item within a specific tote. The Lyngsoe Sorter Controller™ is an intuitive web-based software, which enables libraries through PC or tablet to independently establish and flexibly adjust sorting strategies through sort tables for the Lyngsoe Sort Mate™ 2000 AMH sorters. For example, switching to a “waterfall” strategy on multiple destinations could utilize capacity to the fullest, especially when large numbers of items are returned in the unmanned hours of a holiday period. 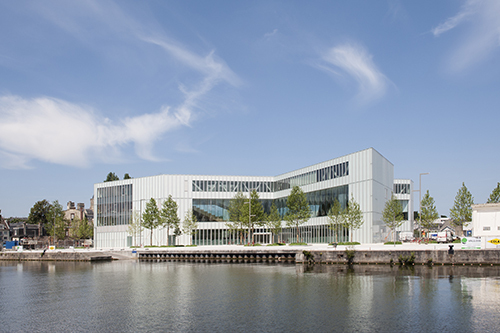 The Bibliothèque Alexis de Tocqueville is the main library for the region of Caen la Mer in France. Early 2017 the construction of the 135,000-square-foot multimedia library was finished, becoming a new public center for the city. In their opening weekend they had 15,000 visitors and in one day 4,000 loans were recorded, breaking their previous record of 800 in one day. The library wanted something new that would match the eye-catching semi-industrial Rem Koolhaas design of their new building and add to the sense of user-focused, inclusive services that inspired the architecture. In addition to creating efficiencies for staff, the library wanted to invite the public to learn more about how a library functions, to include them in the process of moving materials around the building. Just south of Portland, Oregon, USA, a network of 13 members libraries participate in an informal resource and revenue sharing network called Libraries in Clackamas County (LINCC). 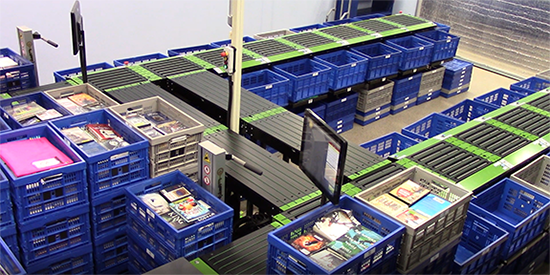 As part of a larger RFID initiative, LINCC chose to implement automated materials handling at its centralized sorting location and added the Lyngsoe Tote Check-In Server™, to extend the benefits of centralized sorting to each library location. A 27-bin Lyngsoe Sort Mate™ system with staff feeds was custom-designed, efficiently using available space while leaving Materials Handling staff enough room for other work. 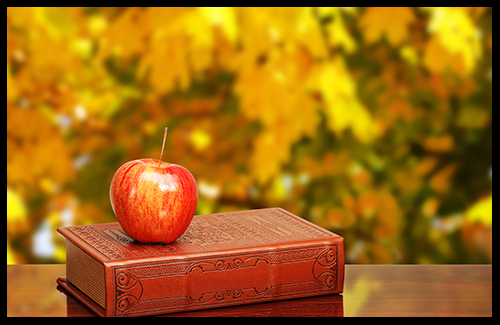 From November 2-4, 2017 our library team will take part in the annual CLA conference in Riverside, California. The theme this year is New Worlds Emerge and encourage you to break existing patterns in your library and community. Book a meeting with us or visit us at stand #201 and learn how our solutions can change your patterns and increase efficiency at your library.